A price list and business cards are also coming with me. And, of course, I would be more than happy to let anyone who's interested in buying test drive it on my bottom. I worked in sales long enough to know the value of doing what you have to do to make a sale. 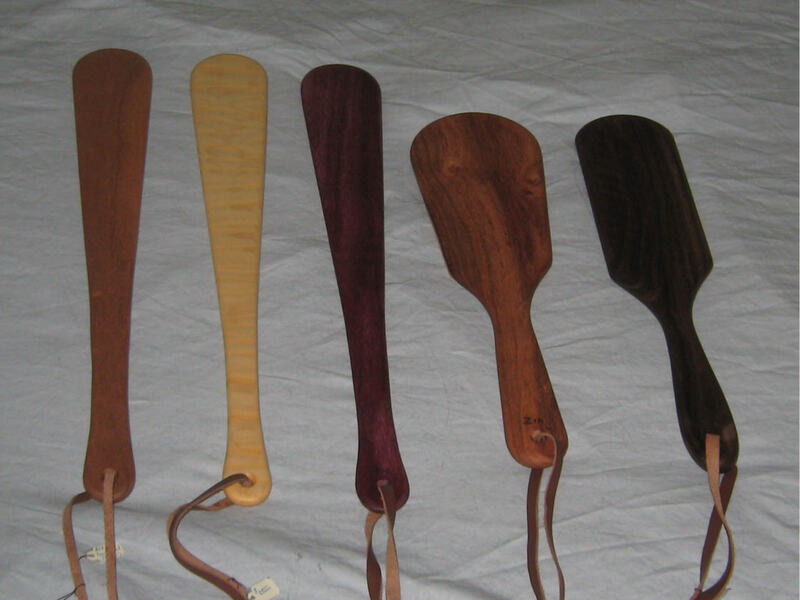 I'm getting a commission, but I would happily do without it because I believe in these paddles. I believe once you feel one in your hand (or on your bottom) you will want one. Wood fans will especially love them. The workmanship is first class, the sizes are realistic and the prices are what you would expect for this kind of quality. The prices seem really reasonable to me. I've seen paddles similarly priced that didn't have this kind of attention to detail and they certainly didn't use these native/exotic woods. The paddles make my toy bags very heavy so I'm hoping to have all of them sold before the party is over. In fact, I'm hoping to have them all sold before Saturday's vendor's fair. Because MrZia didn't put this proposal forward to me until just last week, there wasn't time to purchase a table for the vendor's fair. It wouldn't be fair for me to sit around showing these lovely paddles off when I haven't gone through the proper channels to get a table. So I will only be showing them in my room. This is also for security reasons. I'm not saying anyone would steal them but it has happened to others so I'm being cautious here. MrZia also tucked a special gift into the parcel that arrived this morning. It's wrapped (like the rest of the paddles were) and the instructions state that it isn't to be opened until I arrive at the party. I'm fighting the impulse to just tear off the paper and see what he sent. It just says there's one for me and one for Zelle. There are also two other paddles which she expressed an interest in buying so those are still wrapped as well. I'm probably going to take more wood at this party than I ever have before. And that's OK because this is all for a friend; a friend who was nice enough to send me six paddles and asked nothing in return except for me to see if there was a market for his work. If craftsmanship and quality counts for anything, I expect my toy bags to be much lighter by the time the party weekend wraps up. For those of you who are going, I will see you all Thursday, paddles in tow.